Are you a pilot interested in liberal access to a variety of well-maintained aircraft? Do you dream of learning to fly in a professional, safety-oriented way? Are you an ex-pilot who misses the exhilaration and freedom of personal flight? Are you looking to add a new rating such as Instruments or Commercial? Do you want to become part of an active flying organization? Want to fly a Complex? We have a New SKYLANE! 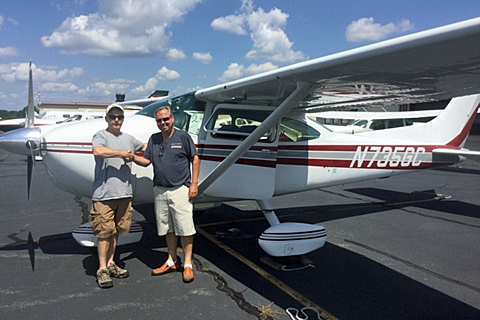 Oxford Flying Club recently purchased a new aircraft, a beautiful 1977 Cessna C182Q Skylane. Our new Skylane is extremely well equipped with a Garmin GTN 650 Touch Screen along with dual Aspen Displays, a storm scope, and more. See here for photos and additional details. With this exciting new addition to our fleet, Oxford Flying Club ensures our offering to more advanced pilots with a wider range of experience and skill levels. This complex aircraft also enables club members to achieve the Commercial Rating. N735GC is an especially useful aircraft for extended trips, offering over 5 hours endurance at over 150 knots and a useful load of ove 1000 pounds with full fuel. 2016 Annual Safety Day at OXC - Hit the Spot for Body, Mind and Soul! Lena is ready to go! First the Soul: Twenty-two pilots took to the skies in their attempt to win our challenging Spot Landing Contest and collect the coveted trophies. Landing an airplane is always a satisfying achievement but when you can touch down precisely where you plan to, it is an especially fulfilling experience. This year two pilots were able to place their aircraft within the 15-foot bull's eye - twice out of three tries! First Place was shared by Student Pilot Javier Hernandez Dias flying the club C-172, and "The Landing Doctor" CFI Lou Mancuso flying his Bristell LSA. Close behind in this very tight contest were Second Place Gavin Earl and Third Place Stewart Rosen, both flying club Archers. 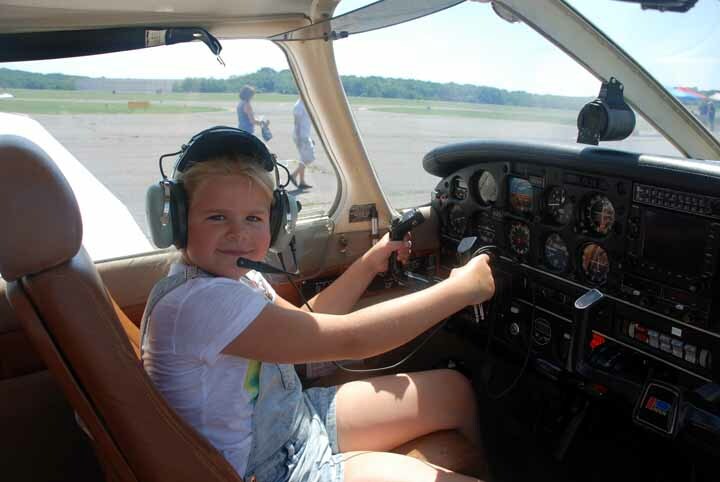 Given that first place was shared by a Student Pilot and a CFI, perhaps more than a few of us were reminded to revisit the focus and discipline that is a part of primary instruction. Then the Body: After working up an appetite struggling to finesse our crafts into the payoff zone we are greeted by enticing aromas wafting across the ramp. Following our noses, we arrive at the grill where Bruce and Dorrie Palmatier are serving up lunch. There are plenty of burgers and bratwurst for everyone, and with no rules - doubles and triples are encouraged! Bruce and Dorrie have been manning the food operation for over a decade and this year was their swan song. THANK YOU! Next summer their apprentices will be challenged to meet such high standards of preparation and execution. Now the Mind: Rubbing our bellies, we make our way over to the hangar where Club President, FAA Master Instructor, and FAASteam Member Burt Stevens is setting up the A/V gear, along with fellow FAASTeam Member Doug Stewart, former CFI of the Year and DPE. First they recognized and awarded the landing contest winners, and then Burt and Doug launched into an interesting presentation on the new Airman Certification Standard. Burt and Doug, along with several others, have been working to revise the Practical Test Standards and have come up with ACS which will be implemented over the next year or two. The goal of ACS is to update the certification process to reflect modern technology, and also to add more precise feedback and enable focus on areas where the trainee may need some additional review. As was demonstrated during the fine presentation, this can be accomplished nicely without adding more time or complexity. We certainly appreciate the time and dedication of these leaders as they work to improve our aviation experience and safety. Another OFC Safety Day is in the books, thanks to everyone pitching in and the excellent leadership and organizational skills of Activities Chair Bruce Richardson. We look forward to continued good flying weather and promise ourselves to get some more pattern time ahead of next year's contest. We had fun catching up with old friends, making new friends, and sharing rides with some who may just be interested in pursuing aviation as an avocation. Watch for announcements of our 14th Annual Safety Day in July 2017! 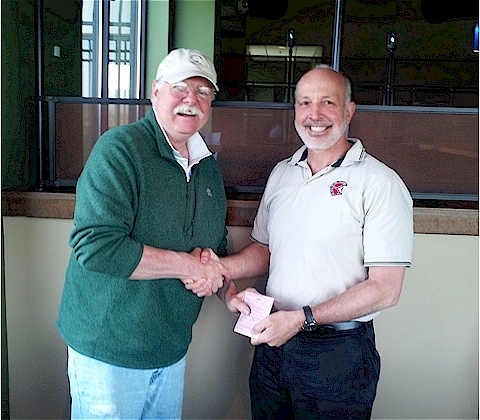 Congratulations to Oxford Flying Club members who earned new certificates during 2014! Oxford Flying Club offers an atmosphere of safety and development where members can expand their flying skills and knowledge and earn new ratings. Our membership ranges from Student Pilots through experienced Airline Transport Pilots with tens of thousands of hours. We all share the excitement and pride of every new member achievement. 2014 Annual Club Picnic at Burt and Molly's! You know it's a great day when you find yourself in the warm sun with a light breeze, gazing out past an enticing pool at a serene lake, surrounded by friends talking air planes, all while holding a plate full of tasty delights. Our annual Summer Picnic was all that and much more. Burt and Molly Stevens once again generously opened their beautiful homestead to host our picnic, and they ensured a great time was had by all. It took some doing, but President Burt was able to corral the attending members together to focus on a brief business meeting. We discussed club plans, activities and finances, and even voted to accept a new member who was attending as a guest. Not one person fell asleep! We then dug into the excellent extensive buffet catered by member Stewart Rosen which ranged from deli sandwiches to pulled pork, lasagne, peppers and sausage, and a variety of other savory delectables. After allowing a little time to digest, the Volley Ball Rivalry between Instructor Ron Schmecker and ex-President Gary Nalband erupted in force. This is an annual grudge match which has been going on longer than anyone can remember. While both sides demonstrated strong spirit and athletic prowess, Ron's Team won the day for the second year in a row. The heroic event was forever immortalized on the ball using a Sharpie indelible pen. It was at this moment that the sweets arrived on the scene. It was tough to decide between all the home-made treats such as the double-chocolate bowling ball, lemon squares, raspberry tort, cookies, and an array of other temptations. But why is such a decision even necessary? Once again we thank Burt and Molly for their generosity and hospitality. It was a great day indeed! Look here for more pics of the day! On June 21st, six relatives of club members attended the pinch hitter course offered by OFC. Scott Oloff led the ground school explaining key flying concepts with analogies so that neophytes could easily understand what the pilot does. For example, the pilot pushes the throttle when climbing just as one presses the pedal of a car when going uphill. Conversely, one reduces the throttle when descending just as the pedal is eased when the car goes downhill. 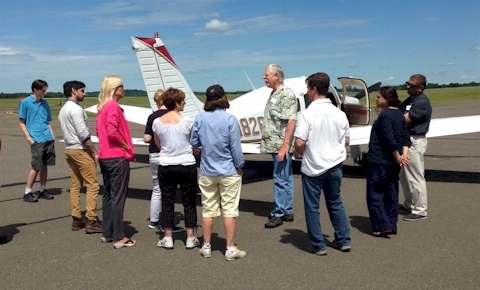 In addition to explaining how the airplane changes attitude on the blackboard, the instructors brought the students to the airplanes to show how the ailerons, elevator, rudder, flaps and trim functioned. The audience was very interested as they asked pertinent questions. One member's spouse said that she went into "prayer mode" when her husband was landing because the airplane was flaring before touching down. She thought that the airplane might take off again. Also, she mentioned that the ground school was very beneficial because she learned more yesterday than in the previous two flying lessons. OFC provided a nice lunch and Molly Stevens baked a delicious blueberry cake! After lunch, we visited the tower and chatted with Scott, the controller on duty. 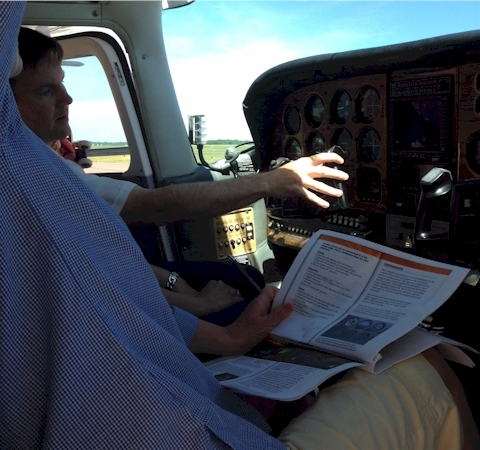 In the afternoon, three instructors took the the pinch hitters up for some flying basics and coached them how to land. A few pinch hitters were so excited about the learning experience that they are considering taking flying lessons! At the end of the day, the pinch hitters were reassured because they felt that they could land the airplane with guidance from ATC in case of an emergency. Thank you Larry, Scott, Ron and Burt for your generosity and Mahesh for organizing this successful event. After finding the VFR instructions for flying to Plymouth too cumbersome because three routes converged at Long Pond, we decided to drive instead. Indeed, we saw "cowboy" pilots cut across the traffic pattern. Other pilots did not have sufficient separation because they were touching down before the preceding airplane had cleared the runway. Speaking with a couple of pilots who had landed confirmed my observations. The good news was that no accidents occurred. 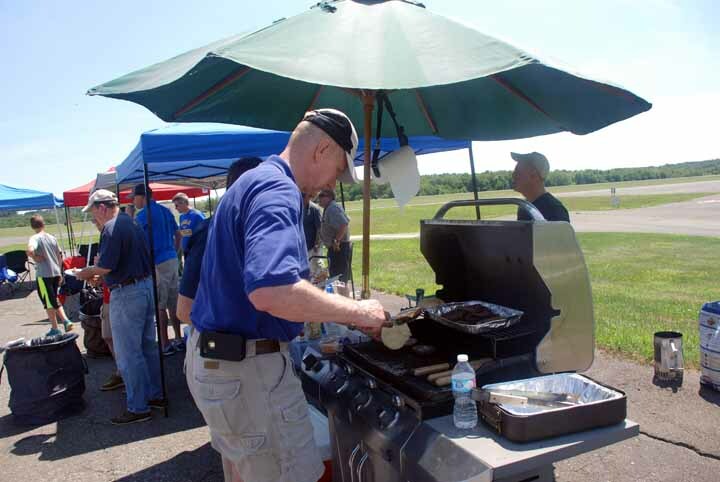 AOPA has a plethora of volunteers manning kiosks, directing automobile and airplane traffic. We attended two interesting seminars "Refine Your Decision Making and Re-define Your Personal Limits" and "Say Again? Radio Communication Done Right". Mike Goulian provided relevant examples on ADM and personal limits. 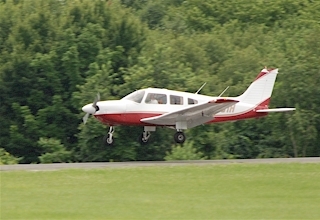 For example, he recounted a story about a planned flight from KPYM to Whelen airport that he canceled because he did not have much experience landing his Cirrus on short runways. So he decided to fly to New London and rent a car to Chester instead. Mike's colleagues joked that they would install crash net and arresting cables just like an aircraft carrier so that he could land at Whelan Farms airport. Later they recognized that Mike had made a sound decision. Mike Goulian did an acrobatic demonstration during lunch. I asked his spouse if she was nervous. She smiled and replied: "Not as long as I don't look up". The second seminar was very interesting because it was a joint discussion between Bruce and an air traffic controller. The ATC person explained radio communications from his point of view. The course is available on AOPA ASF website. Bruce Landsberg mentioned that ASF was solely funded by donations and not by AOPA membership dues. Only 5.7 % of AOPA members donate money. He encouraged us to donate more. Avidyne displayed a new dual function GPS. It has a touch screen as well as buttons. The interface is simply to use than the Garmin 430 and 530 because one does not have to leaf through pages to find information. 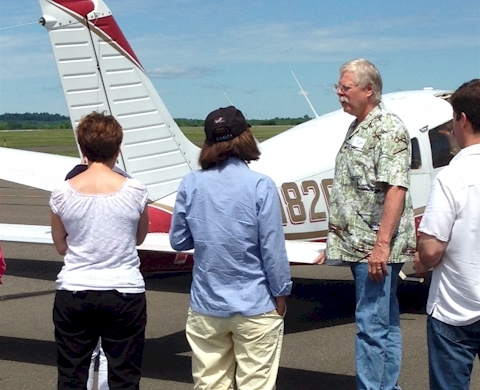 Overall, it was an exciting and well organized fly-in by AOPA. Club Buys a New Archer! After many years of dependable service, Oxford Flying Club has replaced our beloved and reliable Archer N4384F with a newer model Archer N4334X with much lower total time, plus a brand new engine. 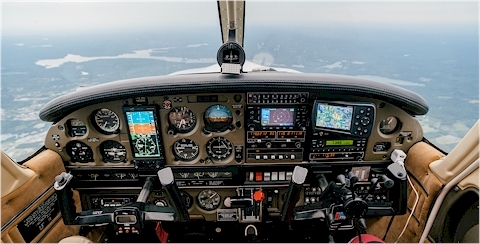 As can be seen from the pictures, N4334X sports an advance panel including an Aspen EFIS, Garmin GSN430 WAAS GPS, plus a backup Garmin 496 GPS. With the S-TEC 60 2-axis Autopilot with altitude hold and approach mode, 34X is a very fine IFR machine. See HERE for a complete list of equipment. 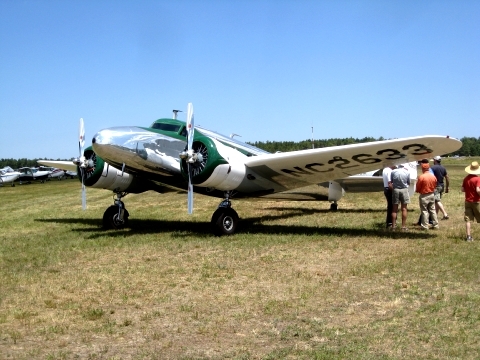 N4384F was purchased by Gary Nalband who served as Club President for more than five years and and oversaw the doubling of our membership and expansion of our fleet from of two to four aircraft. As all club Club planes are extremely well maintained, Gary knows he is receiving a solid ride. N4334X was based at OXC and previously owned by Floyd Moir who has moved on to his own Bonanza. Both aircraft had been and will continue to be based at OXC, so we can all still see them in action and recall good times. OFC Member Ed Shaker Solos on 16th Birthday! Congratulations to our own Edward Shaker who made his first Solo Flight on his sixteenth birthday! As Ed is a modest fellow there were only a few close friends and family on hand to observe this momentous achievement. However we hear reports of excellent airmanship and three perfectly greased landings. There were big grins all around afterward. This is one birthday that will never be forgotten! 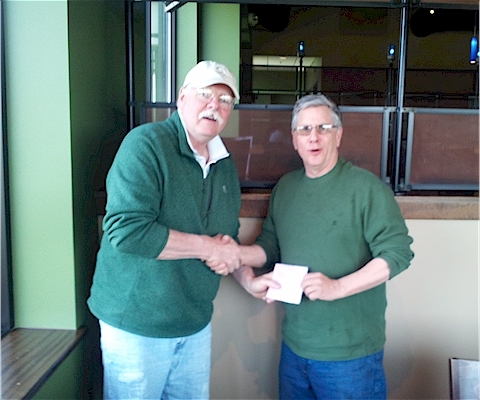 Congratulations also to Ron Schmecker, Ed's Flight Instructor and long-time CFI and mentor for Oxford Flying Club. Said Ron, "I'm very proud of Ed, he is a quick study and I would have soloed him earlier but had to wait for today. I've never soloed a sixteen year old. Hope to do it again." We're all proud of course. Burt Stevens, another OFC Instructor, commented, "I saw two of the three landings Edward made and was on air for his communications with the tower. His ability in the traffic pattern and communicating with ATC should be the envy of many members and other pilots with advanced ratings." Flight training may begin at any age, but 16 is the youngest allowed by the FAA for solo flight. And a flyer must be 17 to earn a Private Pilot License. Ed - we look forward to next year when you meet that goal! 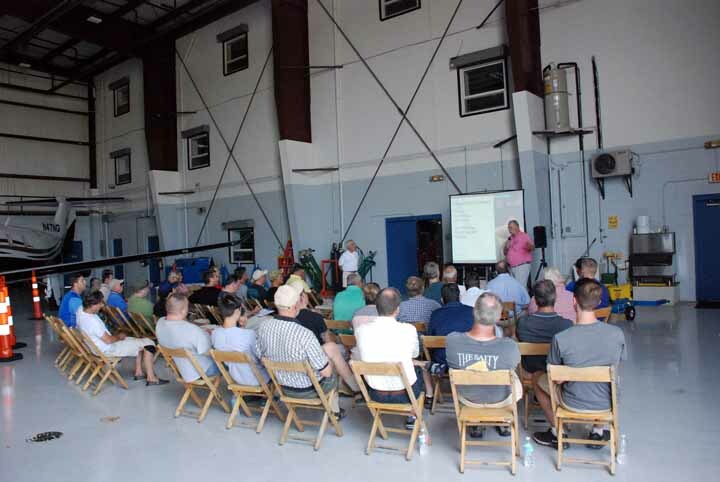 Our own Tony Vallillo has developed an FAA Safety Seminar and presented it several times in the CT area. "As the PRO's Fly" takes us through the ATP's view of a commercial flight from JFK to Rome with parallels useful for GA flights. 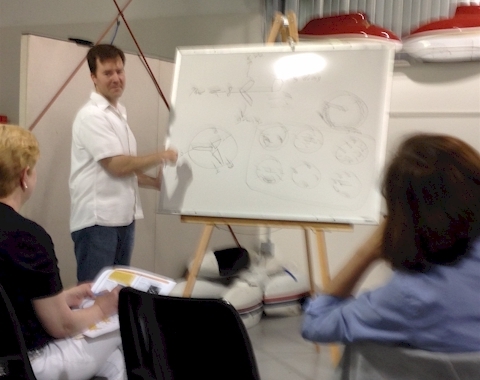 In the Seminar, Tony addresses every phase of the flight from pre-preflight planning all the way to the layover. Topics include weather, flight plan, fuel, documents, inspections, performance, crew, takeoff, radio, clearances, over-water, en-route options, approach, landing, taxi plus a few more suprises tossed in. This seminar is a unique and very interesting glimpse into the thought process of a highly experienced professional airline pilot. "Tony's presentation was simply excellent, far exceeding my highest expectations. He ran through the entire planning and execution of the flight, distinguishing the items that really matter from the ones that are important but less so." "There were many especially memorable parts for me - the considerations for deciding on an alternate, the go / no-go decision upon some failure after take-off, exercising PIC emergency authority to take a nap if required, fuel planning considerations, the walk-around, and many others. While the specifics of our aircraft and missions are far different, the focus on safety and making the best decisions possible at every step were ever evident." "Last Thursday whenever I looked around I saw everyone in the room completely spellbound." Lt. 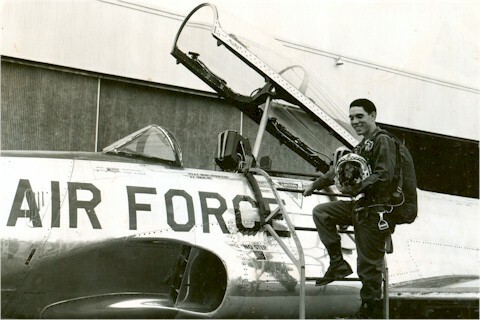 Colonel Tony Vallillo began flying with the United States Air Force in 1971 as a student flying T41, T-37 and T-38 trainers. He spent much of his miltary career as Pilot and Commander of the C-141A Starlifter and C-5 Galaxy with Worldwide Airlift Operations for Military Airlift Command. Tony has extensive military flying experience in Europe, the Pacific, South America, Africa and the Middle East including active duty in Operations Desert Shield and Desert Storm. Captain Tony Vallillo spent his entire 41 year commercial career with American Airlines, starting out as Flight Engineer on the B-707 and B-727 and quickly advancing to First Officer and Captain. Tony then became Chief Pilot for the JFK Base where he was in charge of over 600 flight crewmembers, and also Flight Manager of the American Terminal and Ramp. While at JFK he planned and participated in the design and construction of the new flight operations complex. 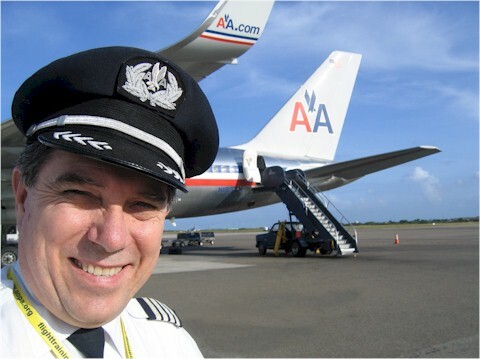 Tony moved on to become Line Captain on the A300 and B-767/757 primarily flying international routes ranging through Europe, the Caribbean, South America, and the Pacific. Captain Vallillo retired from American in 2008. Today Tony Vallillo is Lt. Colonel with the Connecticut Wing of the Civil Air Patrol where he acts as Command Pilot, Flight Instructor, Check Pilot, Chief of Standardization and Chief of Staff. We are extremely proud to have our friend Tony as a member and instructor with the Oxford Flying Club. Congratulations to our own Jay Sabot who won the very prestigious Bronze Lindy for his magnificent homebuilt Legacy N26XY. Anyone looking at this aircraft is impressed with the extreme high quality of workmanship and can tell it was a labor of love. Jay committed over seven years to creating this beautiful machine and involved many club members along the way. Not only does she look great, she flies like a dream and moves like a rocket. 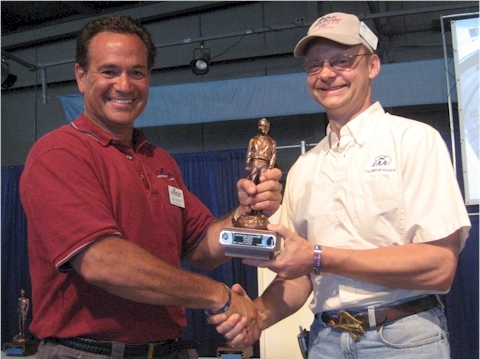 Jay's Legacy is featured in EAA Magazine Sport Aviation January 2013 issue. For more pictures and background on the project check out Jay's Legacy Project. 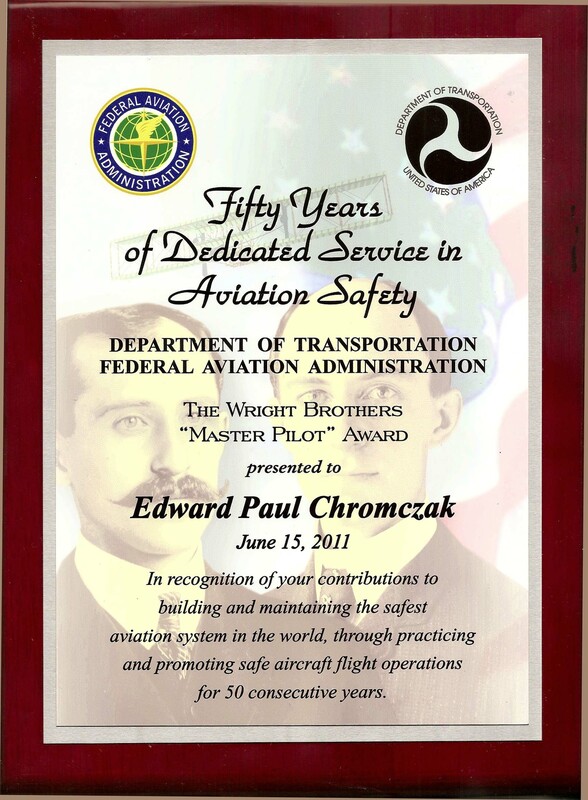 Oxford Flying Club member Ed Chromczak was recently honored by the FAA with the Wright Brothers Master Pilot Award for his "Fifty Years of Dedicated Service in Aviation Safety". 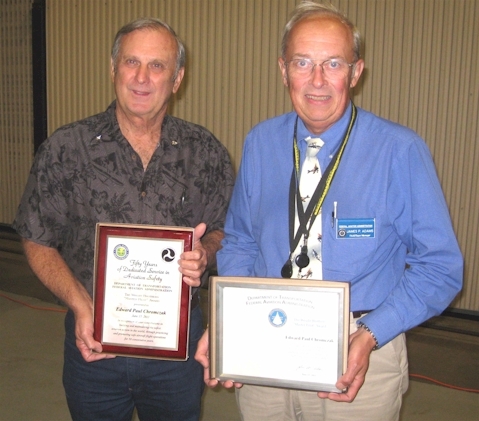 The award was presented to Ed (left) by Jim Adams of the Windsor Locks FAA FSDO before a crowd of family, friends and fellow pilots at a safety seminar held at Oxford Airport. Ed has earned a reputation for going above and beyond, and always looking out for his students and other pilots. 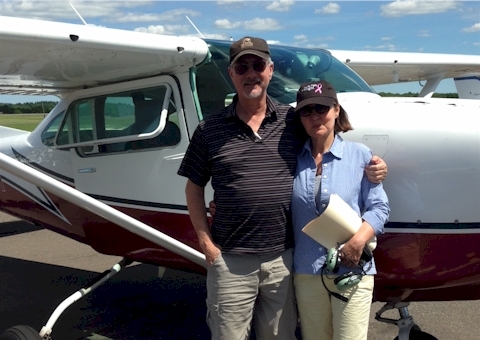 Stories of Ed's generosity abound, such as how he flew our Cessna to a repair station and convinced the mechanics to drop what they were doing to troubleshoot and repair a problem so a student could take his check ride the following day. Another time Ed personally pulled and cleaned the spark plugs so a student would have a smooth running engine for some solo work. As an instructor with Oxford Flying Club, Ed volunteers as CFI for our Pinch Hitter's Course, Soft Field Landing Event, and Night Landing Currency Event. 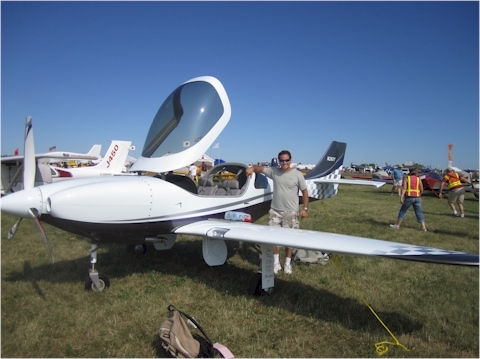 Ed holds an impressive array of ratings including Single-Engine, Multi-Engine, Seaplane, Helicopter, Glider, and Instruments, and is a certified instructor as CFI, CFII, MEI and Glider-I. Ed, congratulations on this very special award, and thank you for your countless contributions to the arena. It's a privilege to know you, have you in the club, and to have you as a friend.